Are you sick of watching your money go down the drain, literally? Living a frugal lifestyle is the cheap way to living rich without giving up an arm and a leg for it. Sometimes you have to get pretty creative to get what you want for cheap. Want to make some extra money from home? Start a blog with Bluehost! If you sign up for Bluehost with my link you get a free domain, free site builders, free 1-click WordPress install, 24/7 support and all for only $2.95 a month! You really can’t beat that deal. I have already made $3000 from affiliate marketing alone after only 6 months of blogging, thanks to the Making Sense Of Affiliate Marketing course. Not sure about starting a blog, no sweat. You can even make money with affiliate marketing on Pinterest! Want to start a blog like this one? Sign up and I can help you out! Alright, let’s get back to it. It makes me choke when I hear what some people pay for the silliest things. Like thousands of dollars on a designer bag. Hasn’t anyone heard of going to the thrift store or buying from highly rated ebay sellers before? What about Amazon!? I was able to get this amazing Marc Jacobs Cross Body Bag for under $100 one day thanks to the amazing saving potential with shopping on Amazon and my Amazon rewards points! Imagine the saving potential you can get when shopping on sites like Amazon, that already have an amazing potential for big savings when combining coupon codes or cash back percentages from other sites like ebates, ibotta, swagbucks, and befrugal!? Give it a try. I love deal hacking for the ultimate savings! I don’t care what it is, I would never pay $1000 for a purse. Or for shoes. Or for anything that is so completely unnecessary. There is a far easier way to live and not get stuck in the earn-spend-earn-spend cycle. How about saving all that hard earned money for something that really matters? And for something you are going to remember for the rest of your life? Having said all that, I want to help you get closer to living frugally and happily! 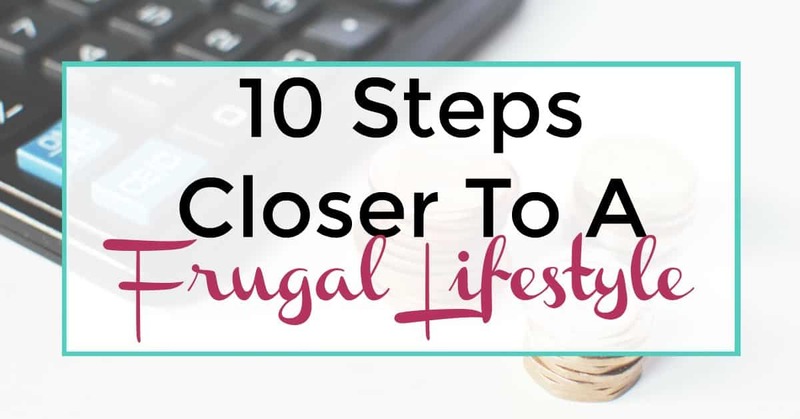 Here are my 10 steps to get closer to a living a frugal lifestyle. You can save on food and grocery shopping by scanning your receipts with Ibotta! Sign up today and get a $10 welcome bonus! There are tons of other amazing ways to save on groceries. You can find financially conscious ways when grocery shopping like using a calculator as you go. You can also see what amazing deals you can get at the farmer’s market or with delivery meal plans. Check out them all here. If you have 2 cars and don’t need them both, try getting by with one. Let’s say you work from home but your spouse commutes for work. That is what my situation is like so, therefore, we only have 1 car. There is no reason for us to have 2 cars, at least not in our specific situation. On days where I know I might need the car for various errands, I will drive my wife to work or we work things out by one of us taking an uber. We use to have 2 cars but the maintenance costs on the other car were too much, especially when transmission issues came into play to we donated the other to Kars 4 Kids. That way we no longer have to spend money on a car that was a money pit and we get a nice tax credit for it too. Give travel hacking a whirl. Travel hacking has been a pretty popular topic and hobby lately due to the rise of air miles cards and rewards programs. Thank goodness travel hacking is a thing because I am obsessed with it. I love learning new ways that I can travel for free, even when I think I have found every way possible. Check out this post where you can discover 12+ ways to travel for free! Let’s say there are just 2 of you (maybe with a couple furry critters…we have 2 dogs) and there are no kids in the picture. There is no reason for you to be living in that 2 story, 5 bedroom house! You are wasting tons of space and tons of money on utilities that way. Downsize your home and stop wasting the space you have. The less you have to worry about, the happier you will be. Trust me. Imagine how much you will save when not paying that ridiculous house payment every month. You might even make some money by downsizing your home. What a win-win! Always get a second opinion when it comes to health recommendations. If it is a serious illness such as cancer or anything else life threatening..please get all the help you need. Sometimes you can’t worry about the money when it is life or death. When I broke my ankle a couple of years back, I opted out of the physical therapy. I did not want to spend the extra money and extra time on something that I could take care of at home with the tips from my doctor. I would go back in for the checkup of how everything was healing at the 6-week mark and that was all I needed. I was already ready to walk at the 6-week mark (2 weeks sooner than most). I saved hundreds of dollars by taking a second opinion and opting out of something that wouldn;t have made much of a difference anyway. Buy used or refurbished instead of new. Certified Refurbished products are tested by qualified manufacturers or third-party refurbishers to look and work like new and come with a minimum 90-day limited warranty. Buying refurbished can save you hundreds of dollars when it comes to electronics. When you need a new laptop for school or work, buy refurbished. I always have and have no regrets! Check out some of these amazing Certified Refurbished products on Amazon! Talk about a great deal and opportunity to save! Want to pave the way for a future of financial freedom? Get loads of tips that I use every day to make extra money and save extra money as I prepare for mine! Sign up for the master list of money tips that I use to get in shape for a future of financial freedom! Stop eating out or eat out for less. Going out to eat is a big money guzzler. What you can make at home for about $10, usually costs twice as much or even three times as much when you are out eating at a restaurant. They also add a ton more calories at restaurants for flavor so you might lose some weight AND save money by eating at home instead. Make your new eating at home diet to good use and make some money by losing weight with HealthyWage! Get $30 off today with this link at HelloFresh! Have you heard of $5 Meal Plan yet? Well, it is pretty amazing. $5 Meal Plan is a weekly meal plan service that can simplify your meal planning beyond belief. For just $5 a month, you will get a delicious meal plan that only costs $2 per person (at the most). Most of the time, it ends up being less per person. The best thing is they have tons of specialty meal plans to chose from so if you have a specific health need that has to be met, no problem! You can try $5 Meal Plan 14 days for absolutely free! Check it out! VeginOut for healthy, organic food. Get $20 off with my link. Get healthy gourmet meals straight to your door with Healthy Chef Creations for as low as $30/day (breakfast, lunch, and dinner). Sign up with my link and get 20% off! Love With Food for all-natural, organic, and delicious gluten free food for only $7.99 a month. Home Bistro includes only the finest ingredients, chef prepared and locally sourced! Get 4 free meals from home bistro by signing up with this link. Chef V is my new favorite! Their mission is to make being ‘healthy’ easier for people by fitting healthy options seamlessly into their daily routine. Sign up for 1 full week supply of meals for absolutely free! You are going to love this, trust me. Use coupon codes when shopping online. Joining a coupon app or cashback site is one of the easiest ways to save money without even knowing it. The way they work is when you sign up, the cashback site will have an extension installed on your browser so you get pop-up notifications of what amount of cash back is available at the website you are visiting to make an online purchase from. Sign up for BeFrugal, get an extra $10 credited to your account after signup, and visit any site you wish to make an online purchase at to see it for yourself. Always check the thrift store for good finds on designer clothing. Every time I take clothes that I don’t need, to sell at our local thrift store, I always check to racks to see if there are any hidden goodies. I have found Coach tennis shoes and dresses hidden among the racks before and managed to snag them for under $20. I have found at least 1 designer piece of clothing every time I have gone to the thrift store. I don’t always buy them but if it is too good to pass up, I am all on it! Use a rewards card to get cash back on all of your purchases. Dosh is an amazing app that you don’t need an extra credit card to get rewards with. All you do is link your existing cards and the app rewards you automatically when you make a purchase at one of their existing offers. I installed it 3 days ago and already made $9! Using rewards cards gets you some great savings! Now that everyone is offering them, no matter where you shop, why not get in on the action because paying full price is just throwing away your money these days. With the Amazon Prime Rewards Card I get so much cash back every month. That is why this is the only credit card I will allow myself to have. I get so much cash back with it that any purchase I make on Amazon is free most of the time! With the Amazon Prime Rewards Card you can get 1%-5% back on purchases, depending on where you make the purchase. You can use the card absolutely anywhere you want! And get cash back for any purchases you make! The best thing about this card is no matter where you are, you are at least always getting a portion of your cash back! I got $150 back already this month and used it to buy some stuff for our yard and camping this weekend! Isn’t that awesome? I basically got $150 worth of stuff from Amazon for free, all because I decided to give a rewards program a chance. Sign up today for the Amazon Prime Rewards Card and start getting cash back on your regular purchases with this link. Great list – we do most of these things, especially the not eating out. I need to get back to Thrift Store shopping though, I don’t do it as much as I used to. Thrift stores can be such a rush when you find something really good! Here’s one that is close to home right now – if you have to buy a car (and even more so if you have to take out a car loan!) get a used, low miles vehicle rather than a new vehicle. This way, 1) you get a better car for the same amount of money (I could pay the same amount for a new car of the lowest-end model as a used car with 9,000 miles on it of the next model up), and 2) You don’t have to deal with that depreciation that happens as soon as the car is driven off the lot because…well, someone else already did! If the unexpected happens and you end up in an accident, you are less likely to have an upside down loan.